“The founders of Robertsville Bible Church believed that the pastor of the church should stand upon the Word of God. They accomplished this literally by taking a hollowed-out stone and placing a Bible in it. 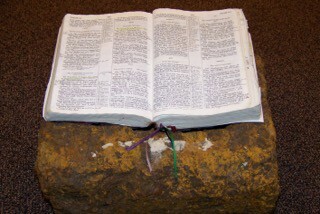 This stone with the Bible was placed under the church building below the location of the pulpit. The stone rested under the church building from 1883 till the building was replaced. The stone and Bible now sit on the platform of the new church. The hope of the founders is lived out each Sunday as the Word of God is faithfully preached. We still use our Bibles in the church services just like the founders of Robertsville Bible Church did so many years ago. The hallmark of RBC is our relationship with the Bible. Services and music reflect the traditional heritage of the church. Rev. McElvaine saw a need for a Bible believing congregation in the Marlboro area and organized the church in 1882. Pastor McElvaine served as pastor until 1917. In 1883, the Church trustees purchased the current property in 2 Church Road in Morganville. The Church originally was known as the Robertsville Methodist-Protestant Church. The area of Marlboro the Church is located in once served as the home of the Roberts Stagecoach Line. The founders of the Church used the name Robertsville to identify the location of the Church. The congregation participated in the formation of the Bible Protestant Fellowship which later became the Fellowship of Fundamental Bible Churches. The Church members also assisted in the formation of the American Council of Christian Churches. During the 1970’s the congregation changed the name to Robertsville Bible Church. Over the years the Spencer Fellowship Hall and Cherry Auditorium (gymnasium) were added. The Church family recently completed construction of the current sanctuary. Some of the older Church members still remember the horse barns and outhouses used many years ago. With indoor plumbing, central heat, air conditioning, and cushioned pews, the facilities are much improved since 1883.